Please call us. We would love to help find the right product for you or create one with you. Customize Your own Gas Outdoor Fire Pit or Indoor Fireplace with options for any budget, Log Sets, Fire Glass and Glass Burners, Indoor and Outdoor Fireplace Controls and Accessories. Many available sizes and shapes for your Fire Place! 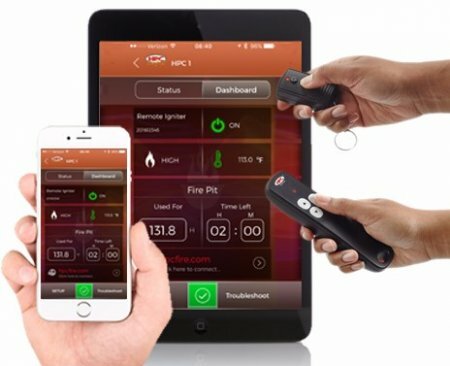 *NEW!High / Low Flame Control Models: This option includes a smart remote and App via smart device control with 2-way communication with the fire pit. Remote allows flame height control while receiving information from fire pit to advise user of fire pit status. *Free Shipping on many items including fire pit kits and Stainless Steel Fire rings. *Best Price Guaranteed! We will Meet or Beat any competitors Price on HPC line of products! *Check out our NEW Products!! This option includes a smart remote and App via smart device control with 2-way communication with the fire pit. Remote allows flame height control while receiving information from fire pit to advise user of fire pit status. unique flower shape that burns more efficiently with an even more natural flame pattern. More longer sizes available and easier to access controls. Our unique Drop-In. Remote Control Fire feature with endless water feature all in one. *Top Your Fire Place with our many choices of media that can be used indoor and outdoor. Fire Rings and Burners , and Accessories including Burner Pans , Unfinished Enclosures, Lava Rock, Outdoor Log Sets, Covers, and Safety Screens . Also Manual Valves, Ignition Systems and Remote Systems. If you need a size that's not in stock please email us at: thecustomfireplace@yahoo.com! We carry Fully Vented Fireplace parts and Toppers that can be used to upgrade or give your Fire Place a complete overhaul or just a new look. We also carry complete Vented Log Sets and Coal Basket that come with your choice of burners and controls. Whether you like the look of a traditional gas log set , or want something more modern like Fireglass or Ceramic Fiber River Rock we have the right media for you. To enhance an existing indoor Fire Place try decorating the fireplace floor. We have Glowing wood bits, Ceramic fiber coals, Platinum Bright Embers, Vermiculite, Decorative Glass, Silica Sand and Volcanic Cinders. When it comes to replacing or setting up a new fireplace with burners and/or controls quality is important and we only sell the best quality. Our Log Lighters for wood burning come in sizes and configurations to fit your fireplace. We have a beautiful selection of Manual Gas Valves and Whistle Free Flex Line to ease installation. Customizable controlled Gas burning kits including U burner kits, low profile H burner kits and our line of unique Glass Burner Pan kits. Our burners give the flexibility to pick your controls and the media that looks right for your home. To go along with our gas burner pan kits or replace existing we have control kits for standard gas installation. Safety Pilot Kits and Millivolt Kits that can be controlled manually or remotely and Electronic Ignition Systems that have no standing pilot and can be turned on and off with Indoor or Outdoor Remote or Wall Switch. The Custom Fire Place is in the top 10% of all Yahoo Stores, with a rating above 4 stars. As a top rated Yahoo Store we know the ins and outs of customer satisfaction. We know our knowledge of products is the best of all online stores. We stand by our customers and since we buy direct from the manufacturer you will love our great prices. Why Natural Gas Over Burning Wood in my Fireplace? Burning wood not only contributes to air pollution, but it will cost you approximately 88 cents per hour to burn. A fireplace burning natural gas will cost you approximately 22 to 44 cents per hour depending on size of burner and no mess.